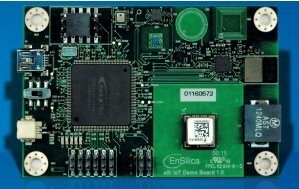 February 9, 2016 - At the forthcoming Internet of Things (IoT) Tech Expo at London’s Olympia on the 10-11th February Ensilica will be demonstrating the new eSi IoT Board, a highly integrated, low-cost hardware platform for developing IoT solutions. The board will be in action on Ensilica’s booth #109. Single board prices start at £149. Based around the Altera MAX10 FPGA and the NIOS or eSI-RISC SoC’s the board provides a highly flexible IoT development and delivery solution. The company will also be demonstrating its portfolio of IP solutions, including eSi-RISC, a highly configurable 16/32 bit embedded processor, alongside IP for communications, processor peripherals and encryption. EnSilica also provides services to companies with in-house ASIC and FPGA design teams. These services include system engineering, analogue and mixed signal design, advanced verification using UVM, DFT and physical implementation. EnSilica has a strong track record of success in delivering semiconductor IP and providing ASIC and FPGA design services to semiconductor companies and OEMs worldwide. The company is a specialist in low-power ASIC design and complex FPGA-based embedded systems, including hardware and embedded software development.